April 14, 1865, just five days after General Robert E. Lee surrendered his Confederate Army to Union General Ulysses S. Grant at Appomattox Court House, President Abraham Lincoln was assassinated. The shock and trauma of losing the President after four years of war with 600,000 dead must have been tremendous. On April 21, after memorial services in Washington D.C. Lincoln’s remains and the remains of his son Willie, having died in 1862, started the long train journey home to Springfield, ILL. The fourteen day trip ended on May 4. Along the way the train would typically travel at night with the Lincoln body placed on display during the daylight hours. At midnight on April 29 the special train left Cleveland on the Cleveland Columbus & Cincinnati Railroad arriving at Columbus Union Depot at 7:30am. The casket was carried to the Ohio State House in a hearse drawn by six horses. 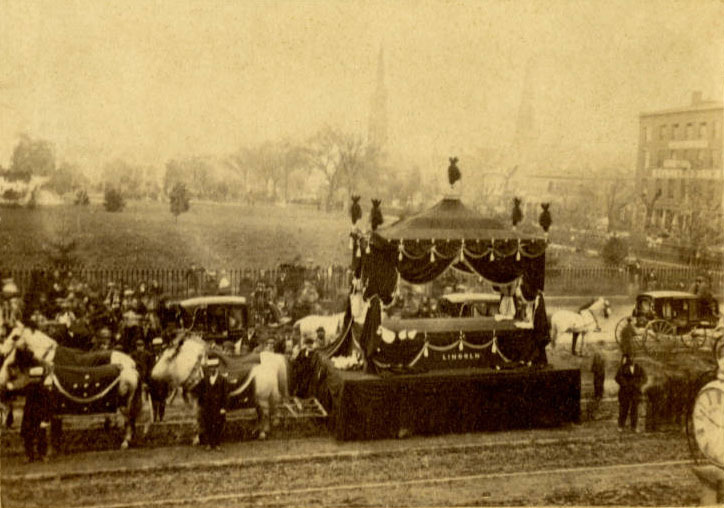 The funeral train was moved west of Union Depot where it was viewed throughout the day. At 6:00pm the casket was returned to the train. 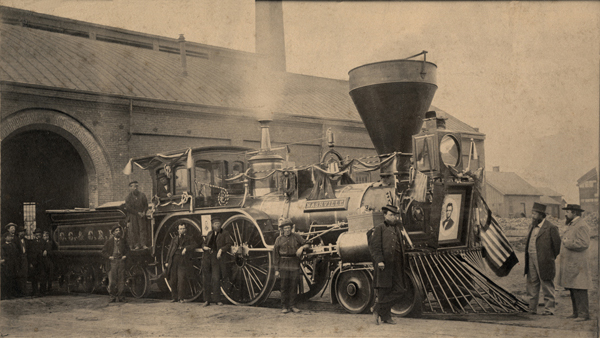 At 8:00pm the train left for Indianapolis on the Columbus & Indianapolis Central Railway. The Cleveland Columbus & Cincinnati Railroad’s locomotive “Nashville”, used to pull the Lincoln Funeral Train from Cleveland to Columbus. 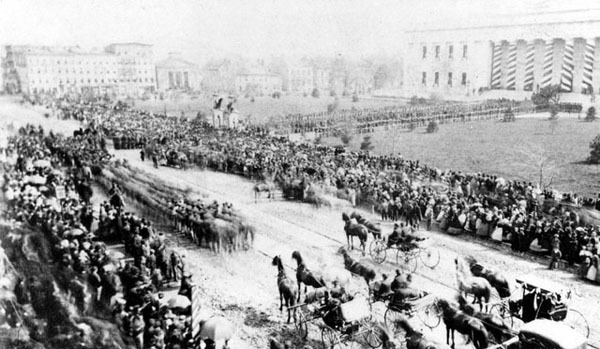 A one car train carrying a contingent of soldiers led the funeral train to Columbus. The funeral train left Cleveland at midnight and arrived at Columbus Union Depot at 7:30am. Photo taken on April 28, at the CC&C RR roundhouse in Cleveland, from the Library of Congress Collection. 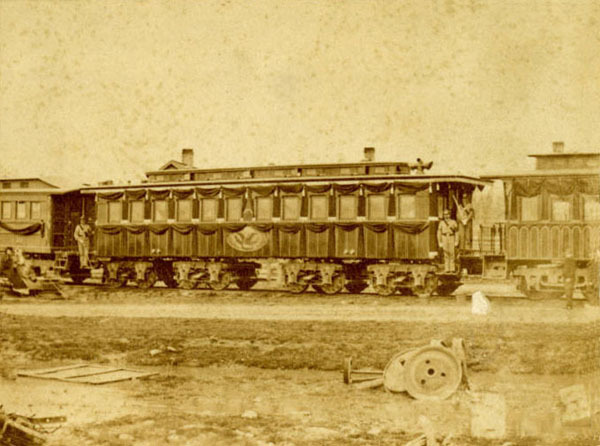 A newly completed private railroad car built especially for President Lincoln was used to carry the two Lincoln caskets to Springfield. 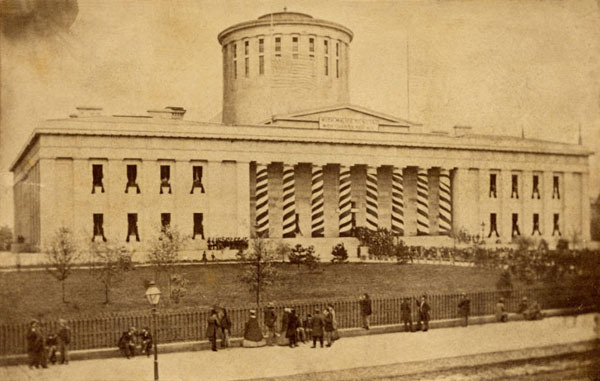 This photograph was taken in Columbus, April 29, 1865, from the Ohio Memory Collection. The hearse with its six white horses has just turned east on Broad Street. The building in the distance that looks a little like the white house was an embellishment by the artist. The hearse took a circuitous route from Columbus Union Depot to the Ohio State House where the casket was placed on view. 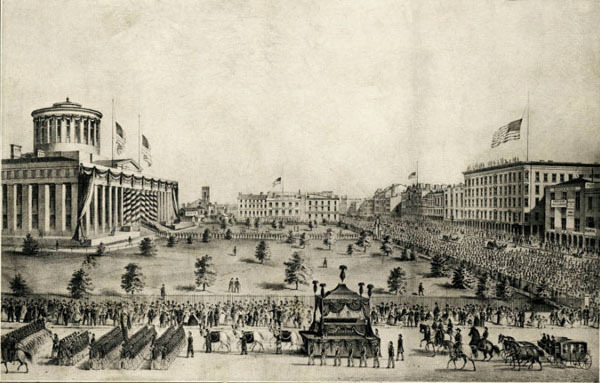 The processional traveled south on High Street, east on Broad Street, south on Fourth Street, east on State Street, south on Seventh Street, west on Town Street, and finally north on High Street to the front entrance of the State House. Drawing from the Ohio Archives Collection. The hearse is on High Street approaching the Ohio State House front entrance. Drawing from the Alex Campbell Collection. 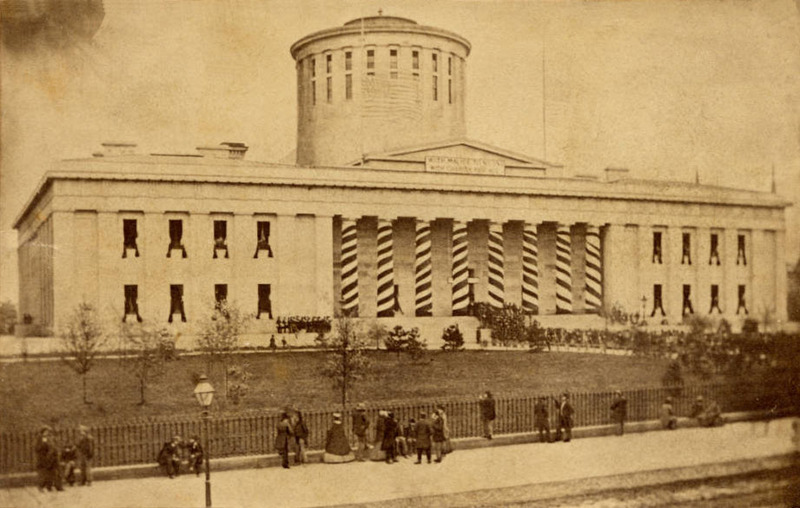 Citizens have come to the Ohio State House to pay their respects to President Abraham Lincoln as his casket is being delivered to the State House rotunda. Special trains came to Columbus from surrounding towns bringing even more people. Later the same day the crowds are still lined up to pay respects to their fallen President. The sign over the entrance reads “With Malice to No One, With Charity for All” words of Abraham Lincoln. Photo from the Ohio Memory Collection. At 6:00pm the hearse is on High Street in front of the State House ready to pick up the casket for the return trip to the funeral train. At 8:00pm the train will leave for the overnight trip to Indianapolis. 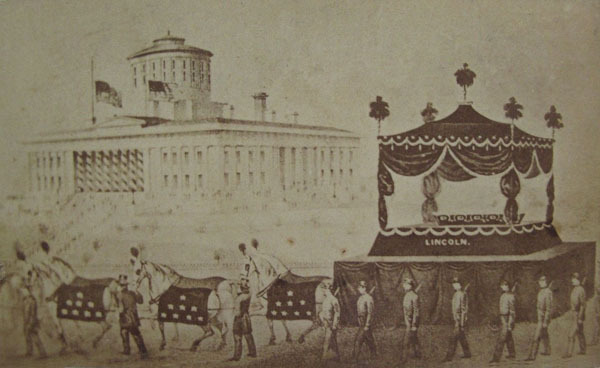 The Lincoln Funeral Train arrived in Springfield, ILL on May 4, the end of the journey. The Civil War ended on May 13, 1865. Abraham Lincoln’s Long Goodbye – CBS Sunday Morning May 10, 2015. Lincoln’s Funeral Train B&O Railroad Museum TV Network, April 2015.